H.J. Metcalfe Photo Studio (Photographer) . [Winnipeg, Man.]. Winnipeg: H.J. Metcalfe Photo Studio, Robinson Dept. 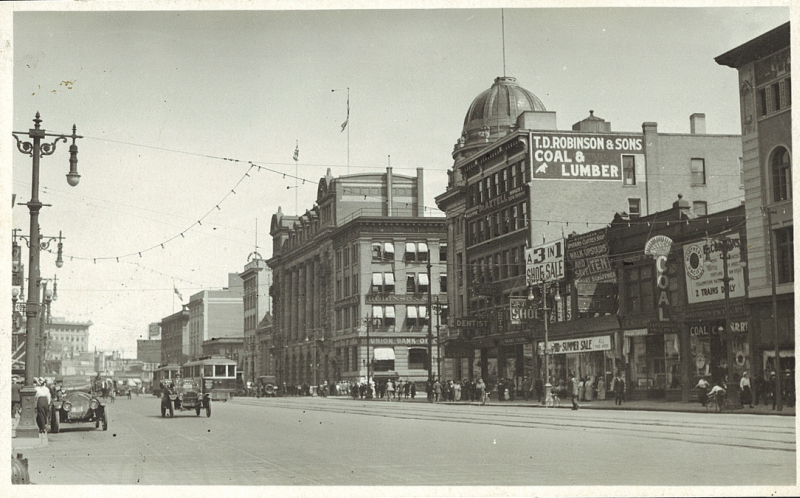 Store, Winnipeg, [1920s]. Description: View of a commercial street in town with stores and shops on the either side or pedestrians on the sidewalk and cars are driving and parked on either side. The street has streetcar tracks down the middle. PC011540: "[Winnipeg, Man.]" is licensed by University of Alberta Libraries under the Attribution - Non-Commercial - Creative Commons license. Permissions beyond the scope of this license may be available at http://peel.library.ualberta.ca/permissions/postcards.html.